Miguel Angel Jimenez, Victor Dubuisson and Jamie Donaldson are among the latest batch of big names added to the field for this month's Irish Open. Headliners at Royal County Down will include event host Rory McIlroy plus Rickie Fowler, Sergio Garcia, Martin Kaymer, Patrick Reed and Ernie Els. Graeme McDowell, Darren Clarke, Luke Donald and Lee Westwood will also play. 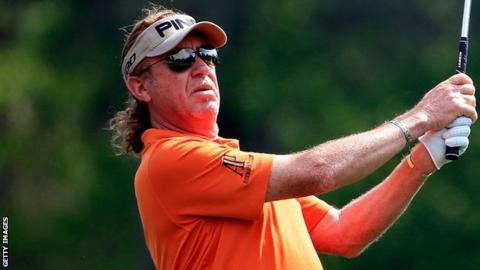 And on Thursday, Jimenez, Dubuisson and Donaldson were added to the entries with Danny Willet and George Coetzee. Dubuisson, Donaldson joined McIlroy, Garcia, Westwood and Kaymer in helping Europe clinch victory in last year's Ryder Cup at Gleneagles and Scotland's Stephen Gallacher is another of that successful side that will tee up at Royal County Down. Winning European Ryder Cup captains Jose Maria Olazabal and Paul McGinley will also be among the entries as will 1999 Open champion Paul Lawrie and emerging Danish star Thorbjorn Olesen. And the depth of the field for the 28-31 May event is emphasised by the presence in the entries of the likes of Tommy Fleetwood, Anirban Lahiri, Branden Grace, Bernd Wiesberger, Thongchai Jaidee, Matteo Manassero, Robert Karlsson, Alvaro Quiros, Pablo Larrazabal Rafa Cabrera-Bello, Nicolas Colsaerts and Francesco Molinari. Indian Lahiri and Grace have both been among the winners on the European Tour this season. Lahiri clinched both the Malaysian Open and Indian Open titles in February a few weeks after South African Grace's sixth European Tour win at the Qatar Masters. A strong home entry will include Michael Hoey and Shane Lowry, who won the event as an amateur at Baltray in 2009. McIlroy's charitable foundation is hosting the 28-31 May event and he has coaxed a host of top stars to compete. American Patrick Reed and England's Lee Westwood will also participate. The prize fund for the European Tour event has also increased by 25% with this year's purse just under £1.8m.